The Chancel Choir rehearses every Thursday at 7:30 PM from September to June for rehearsal, and 9:30 AM on Sundays to prepare for service. The children’s choir rehearses every Sunday just prior to Church School during the Worship Service. 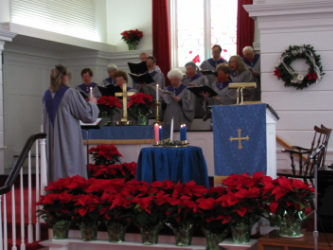 The choir performs one or two songs during the Worship Service on the last Sunday of each month. All children are welcome and encouraged to join! Beginning a bell choir is a goal in the coming year. The church has at least a 3 octave set of White Chapel Hand Bells. Through member interest and commitment we hope to begin the ensemble.